I have to admit, its design takes some getting used to. Coupe SUV's are a new thing and initially failed (anyone remember the Pontiac Aztek?). However compared to what Mercedes and BMW are up to, the E-Pace is the sleekest of them all. I'm a fan of the new design language, but not so much of how JLR has chose to price it in their lineup. Moderately equipped and your looking at the same kind of money for its larger brother. 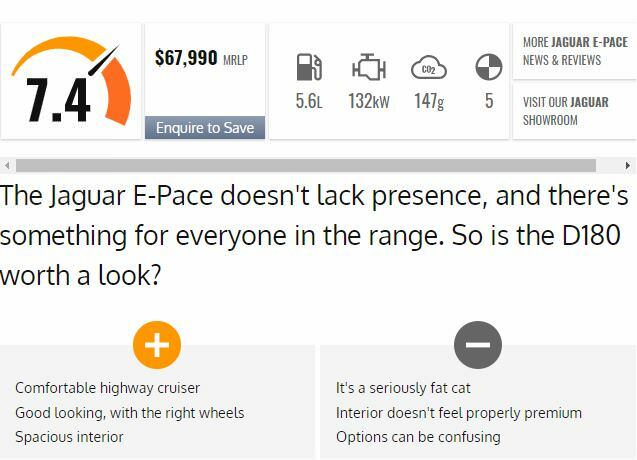 Compared to what else is selling well from other car makers, the E-Pace viewed on its own makes sense. Just don't look beyond that in the Jaguar range. I prefer the new design language of the E Pace and I have a feeling that the rest of their SUV models will be following suit. There are already talks of a new C Pace joining the lineup. They will certainly be expanding upon their SUV lineup and making cuts to their sedans. I know the XE is getting a refresh, but I doubt that will give it much more traction in a sliding segment. XE will probably get one of its last refreshes before hitting the chopping block. Personally I think they need to stick to one that rivals the Mercedes E-Class. Some auto publications seem to think that Jaguar will replace both the XE and XF with a single EV. Long term there isn't much viability left to Jaguars sedan lineup, and a new electric platform would help breathe new life into this segment. The XE and XF are only at the middle of their product cycles. I personally think its a good strategy and that there's space for something below the E-Pace. If Mercedes can do well with the GLA and likewise with similar products from other automakers, its a clear indication of where things are going, or better yet where they're at right now.